Continuing on our tradition of sharing the faces in the Tap Room and our Brewery, we’re bringing you another familiar face you may know if you visit our Tap Room! Meet Peter Huhn, a local who joined our team after converting from a dedicated local customer into employee. Next time you swing by the Tap Room, make sure to say hello! I had always been passionate about craft beer, so my roommates and I decided to brew at home. Needless to say the first few batches were awful, but that’s where it all started. I found myself working in restaurants with a selection of craft beers and spent my time drinking only craft beer and figuring out what I liked and didn’t like. I would taste as many different things as I could, learn about the process when I had time and discuss it with whatever bartender would let me. So while helping open and General Managing a restaurant in Boston, I would walk past Dorchester Brewing Co. every night and stop in for a few. The staff started to know me and when they weren’t busy, we would all chat and hang out. Eventually I got wind of a position opening up, my new friends urged me to apply, and then all of a sudden I was in. When this opportunity came up I knew I had to take it. Haven’t looked back since. My first job was working in my Uncle’s hardware store when I was young talking to guests and helping them find what they needed. Helping out guests and making them happy always made me feel satisfied. My dad was a chef in restaurants in New York City, so my love for food came from that. Ultimate, I decided to combine the two and work the front of the house in restaurants. Since my first job in college bussing tables, I never looked back. This industry is incredibly rewarding but brutal. You work long hours, you have a lot on your plate, and you have to be practically crazy to do it. But the networks you make, the satisfaction of making someones day, and the friendships along the way all make it worth it. I cant see myself in any other field, because no other field is as crazy and as tightly-knit as the industry. Make sure the day runs smoothly! When I get in, I am in charge of making sure the staff has everything they need to operate smoothly. Guests have to be happy, beer has to be flowing, and rules have to be followed! You will either see me behind the bar, or strolling around the tap room making sure everything is fine and people are having fun. Favorite part of the job has to be closing time. Not because people are leaving and the day is done, but because that tends to be the most personal moment at the bar. There isn’t much left for us to do, giving us a few minutes to actually talk and have more in-depth conversations with whoever is left at the bar. I get to hear about who they are, why they came to Dorchester Brewing Co., how we may or may not have made their day and whatever else is on their mind. Something about closing time just tends to be the most personal time of the day. Tough to say! Beer is changing and evolving so much its hard to lock yourself in to one style of beer as your favorite. It all depends on the season and my mood I guess. If I absolutely had to choose, I would think I would have to go with any barrel aged imperial stout. So much flavor can be packed into it, plus you only need one or two to really feel it. Saisons are really starting to creep up on my list. My favorite beer DBco has ever brewed was on tap when I was still coming as a regular. It was the Divination, a Bully Boy bourbon barrel aged imperial stout. Heavy chocolate notes, very boozey, not overly sweet, and subtle smokiness from the barrel. I could drink gallons of it and never get tired of it. Since we opened our doors in 2016, we have been proud to stand behind the quality control measures that we’ve put in place to produce the best end product that our customers enjoy drinking! 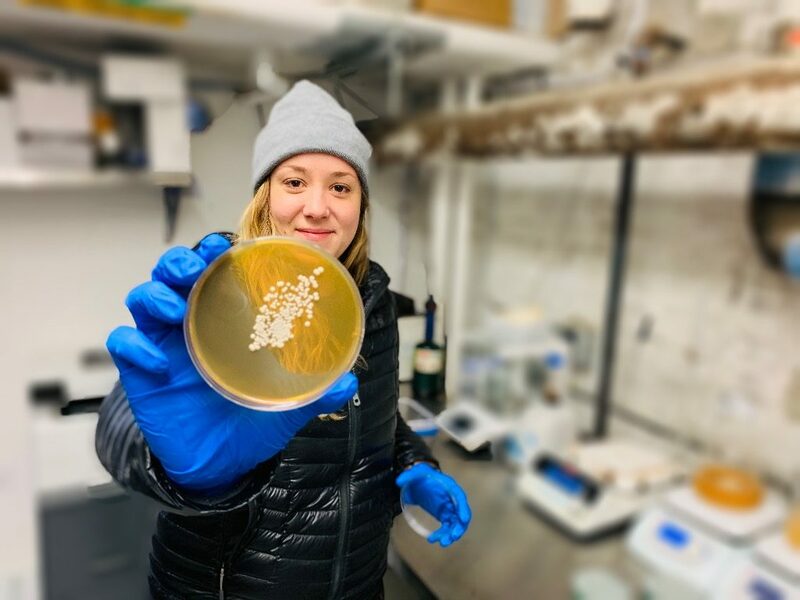 We are happy to introduce a face behind the scenes who helps to create the fresh, clean flavors and taste of all of our partner and house craft beers, all which are made right here on-site in our Boston brewery. Thanks to her expertise and dedication, you get the benefit of enjoying all of the DBco beers that pass through our doors! So, today, let’s raise a glass to Sarah Pott, our QA/QC Manager at Dorchester Brewing Company. I grew up right outside of Portland, Maine where there is a plethora of amazing beer (and food). Living in such a small community, it wasn’t difficult to connect with people within the brewing industry. Right out of college I basically just volunteered at whatever brewery would have me. That’s how I got my foot in the door before participating in ABG’s brewing school. Tell us a little bit about what you do at DBco on a day-to-day basis. What do you like best about the brewing industry? THE PEOPLE! 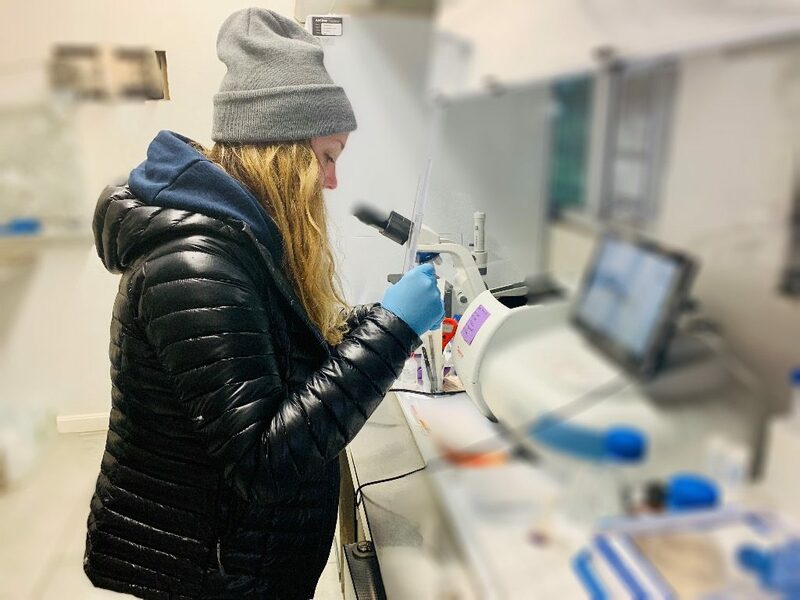 Most people in the brewing industry don’t just accidentally fall into it, they actively seek it out, which typically means these people are extremely passionate about what they do. They want to be here. I’ve met so many intelligent, creative and passionate people working in this industry, which makes it all worth it. Contentedly walking into work everyday knowing I stuck with my passion and that I’m not sitting in an office somewhere. With International Women’s Day on the horizon, we are working to celebrate all women in the beer industry and females worldwide. 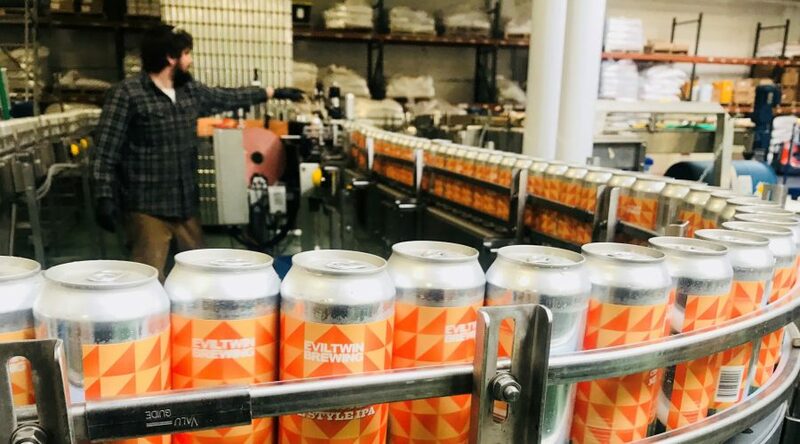 Read more about our special collaboration beer release with proceeds supporting several institutions to empower women everywhere. 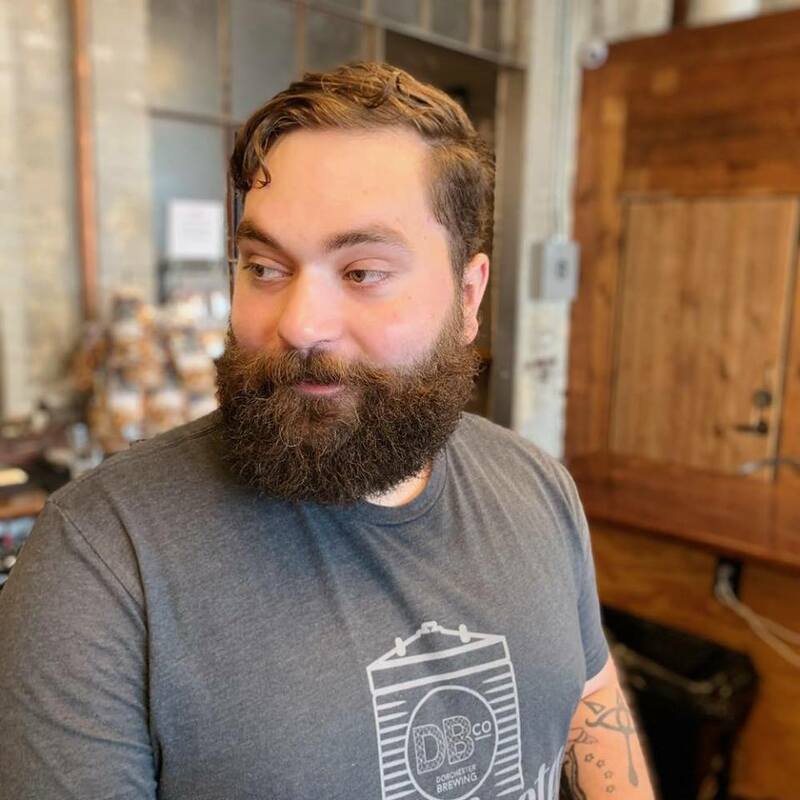 With that in mind, we’d love to introduce you to an awesome member of our brewing staff, who works to bring you fresh, tasty beer weekly in the DBco Tap Room and beyond. Meet Colleen Rankin. I grew up in Akron, Ohio, where I lived through college. Since then, I have had stints living in Russia, Columbus, Baltimore, Washington state, Oregon, and Cleveland. 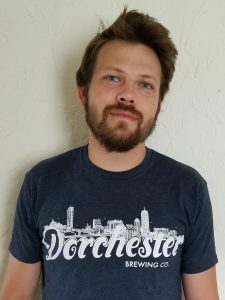 I moved to Boston in July to work for Dorchester Brewing. When I’m not brewing, you can usually find me doing something outside — biking, climbing, skiing, hiking, etc. — or reading a book, listening to music, or wandering around town looking for good cocktails, coffee, or beer. How did you get into craft beer and become a brewer? My fascination with craft beer began in my early 20s, when I had become bored of drinking Rolling Rock and Newcastle Brown Ale. Not too long after discovering craft beer, I started dabbling in home brewing. Looking for a more fulfilling career choice and dissatisfied with working for the man, I woke up one day and decided to become a production brewer. I was lucky enough to find a terrific brewer in Eugene, Oregon that felt that I had the stuff necessary to succeed in brewing, so he gave me an Assistant Brewer position with no production experience, which is quite a lucky thing in this industry. After working at Sam Bond’s Brewing in Eugene, I put in a good stint as an R&D brewer at Platform Beer Co. in Cleveland, Ohio, and now I’m here brewing up fantastic brews at DBco. Working hard to gain knowledge and experience, I hope to eventually open my own brewery. What’s so special about the brewing industry? I like brewing because it is both hands on and intellectually driven. An average day’s work allows me to work hard doing manual labor, which is really satisfying, and use my brain in the course of operating mechanical systems, trouble-shooting problems, or writing recipes. I have had successful jobs behind a desk and other, equally great jobs, working outdoors and in customer service; I find that brewing really feeds all facets of me as a human. It brings me good balance that keeps me feeling good about going to work every day. Since I started brewing, my favorite thing to do is to hose out the whirlpool vessel. It is so satisfying to me to start with a massive mess of a hop pile and end with a shiny and clean tank. The process of transformation from mess to cleanliness is a really satisfying thing. It is so laughable, I know, but it is the little things in life. On a broader level, I love the process of creating a beer from start to finish — beginning with an idea, writing a recipe, brewing it, caring for it during the fermentation process, then pouring it into a glass that the masses (and I) get to enjoy. I think that is a really rad thing. My favorite beer style generally changes with the seasons, but I love them all. Dark, light, Belgian, American, sour, IPA, or cask, I try not to get stuck in the rut of drinking one style more than the rest. Every style of beer has the prefect time and place for appreciation and enjoyment. To date, my favorite DBco. beer (that I wasn’t the mastermind behind) is Born to be Mild, an English Mild Ale that we released a batch of a while back. My favorite partner beer is probably Stupid Head by Stillwater Artisanal, a delicious double-dry hopped Hefeweizen style ale. You probably recognize so many of the friendly faces behind our Tap Room bar and if you’re lucky, even spent quite a lot of time chatting about all things beer and what we do here at the brewery. If you haven’t been so lucky to get close and personal with our amazing staff, we are happy to share some fun facts in our “Meet the Team” blog series. If you want to check out more of our awesome team, find the blog posts here. 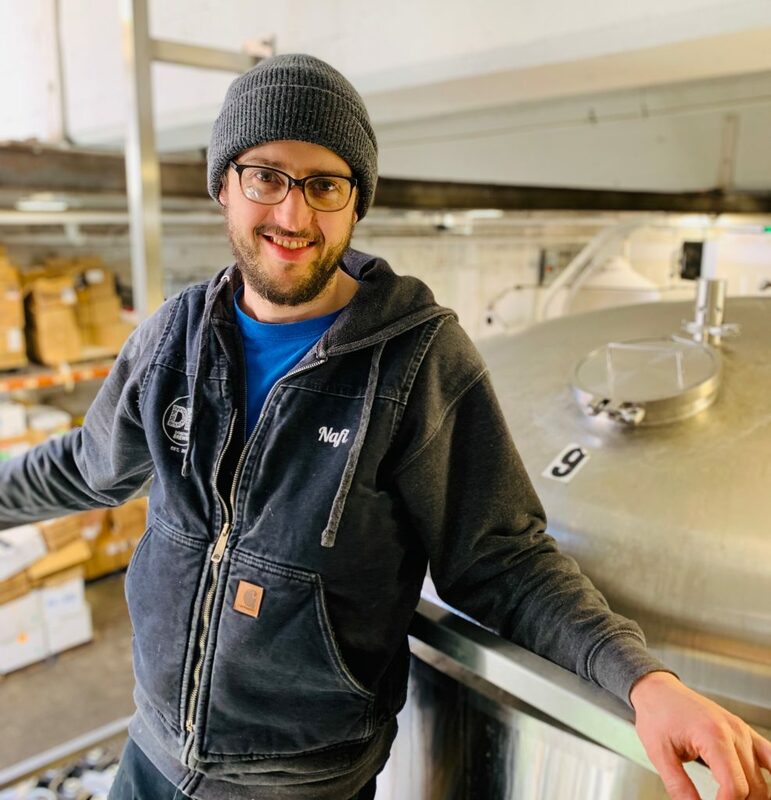 Today we are happy to introduce you to one of our Assistant Tap Room Managers, Levi, who helps the whole Tap Room run smoothly and make sure you are having a great experience drinking and learning about our beer! He is a perfect person to ask about all things craft beer and brewing thanks to his beer-centric background, as you’ll soon learn. You may know all about our folks up front that serve the beer in our Boston brewery..and a little bit about those folks that actually brew the beer. But, there are a bunch of other vital areas of the production process which helps to bring you the freshest craft beer to your bellies. For example, we could not do what we do everyday without our Packaging Team! They are the real heros that manage the process of taking the sweet nectar from product to package so you can drink it up. 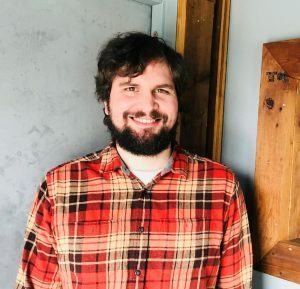 So, today, we’re excited to introduce you to Joe Carani, our Packaging Manager here at Dorchester Brewing Company. So, how exactly did a finance guy with a college degree in Political Science/Religion working at a bank in Portland, Oregon trade in his suit for rubber boots in Boston? Joe bought a home brew kit on a whim and basically went crazy getting into it with a buddy of his and his side hobby snowballed from there. Still working in finance, he moved to Illinois and took a side gig as a bartender at a local brewery to continue being around beer as much as possible. 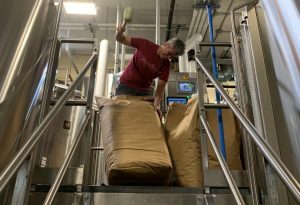 He hopped in to help the brewery with some brewing needs and ended up with an actual job in the back of the brewery, working his way up from job to job. He’s done pretty much every position from Racker, Cellar Manager, Brewer, Packaging Manager, which led him to us at DBco! So, what exactly does Joe do at DBco every day? To start the morning every day, Joe prepares the canning line for production. That means sanitizing it and setting it up to run cans for the day. Next, is actually running the cans. We can run anywhere from 15-20K cans per day with up to two different beers. Some days also involve kegging and racking. At the end of the day, we clean, sanitize, get some more cleaning in and then get prepped and ready for the next morning. Where does Joe’s passion lie? 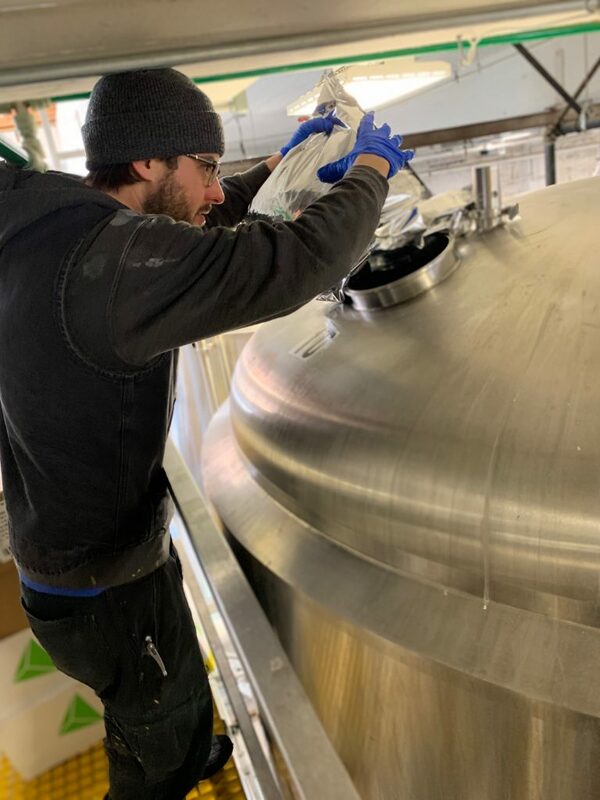 Joe initially thought he wanted to be a brewer when he first got into beer, but he actually found his passion elsewhere in the process…by looking at challenges and fixing problems that arise with his quick-thinking problem solving skills. For example, he’s always looking to create efficiencies to make processes better and faster. Which is a great fit as a Packaging Manager! Lastly, and most importantly, what beer does Joe like to drink? His favorites styles to sip on are Kolsch, ESB or Oktoberfest depending on the season of course, but his absolute favorite DBco made beer would have to be our German lager, Zwickelbier.